Russia's Seizure Of Ukrainian Ships Is An 'Outrageous Violation,' Haley Says At U.N. The countries are trading blame over a maritime dispute in which Russia fired on Ukrainian vessels, injuring some sailors. The incident has sparked Ukrainian protests and an international backlash. "In the name of international peace and security, Russia must immediately cease its unlawful conduct and respect the navigational rights and freedoms of all states," Haley said, speaking at an emergency meeting of the U.N. Security Council late Monday morning. Haley said she was speaking for "the highest level at the American government," after consulting with President Trump and Secretary of State Mike Pompeo. Haley spoke one day after Russian warships fired upon the Ukrainian navy ships Berdyansk and Nikopol and the tug boat Yana Kapu — ramming at least one vessel and wounding several crew members on Sunday, Ukraine says. "All hell broke loose" on the water, said Volodymyr Yelchenko, Ukraine's ambassador to the U.N., saying the Ukrainian ships were set upon after being forced to wait for secure passage through the strait. He said he has audio recordings of radio traffic showing how the Russian military orchestrated the episode. Holding up a copy of the 2003 treaty between Russia and Ukraine, Yelchenko said Russia was guilty of "an open act of military aggression" that broke a number of international and bilateral agreements. Ukrainian President Petro Poroshenko said, "This is clearly an element planned by Russians in the escalation of the situation in the waters of the Sea of Azov, which has been lasting for several months. And I'm sure this is still not a culmination." On Monday, the seizure prompted Ukraine parliament to vote to impose martial law within its borders, a move requested by Poroshenko. "Martial law will last for 30 days" and conclude in December, Poroshenko said as lawmakers debated the move. It would formally go into effect on Wednesday, he added. Responding to widely asked questions about how the adoption of martial law could affect Ukraine's plan for national elections, Poroshenko said they would still take place by March 31. He also said he would evaluate conditions at the end of December. Poroshenko said the interdiction represents a "new stage" in Russia's actions against Ukraine, calling it a departure from what he called a "hybrid war" that has been waged in recent years. In the Security Council session, Russia's Deputy Ambassador Dmitry Polanski said Poroshenko and Ukraine had provoked the confrontation and then used a "mythical Russian act of aggression" to further its own ends. Video from a Russian ship, which included strong language from the bridge crew, shows it ramming a Ukrainian tug boat. 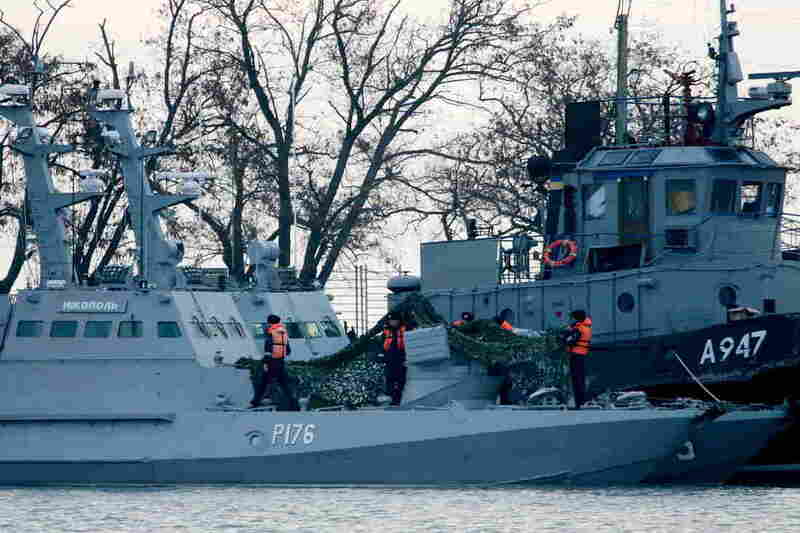 Ukrainian officials have said six of its sailors were injured; Russia has said three. The boats were towed to a nearby port. In response, Poroshenko called a late-night meeting with top security officials in the capital city of Kiev. Poroshenko's request to impose martial law met with mixed responses in Ukraine, as it would restrict Ukrainians' civil liberties and increase state power — and give the unpopular president a free hand to postpone elections in March, where he faces an uphill battle to hold onto power. Trump told reporters that he U.S. doesn't like what's happening between Russia and Ukraine and that the international community is working together on it. The governments of Germany, the U.K. and other European nations have condemned the seizure of Ukrainian ships and called on Russia to return the vessels and restore safe passage through the strait. A spokesman for the FSB, the country's Federal Security Service — which oversees the coast guard — said the Ukrainian vessels violated territorial waters and had to be stopped. "The FSB said it had been forced to act because the ships — two small Ukrainian armored artillery vessels and a tug boat — had illegally entered its territorial waters, attempted illegal actions, and ignored warnings to stop while maneuvering dangerously." "This is a very dangerous provocation, which requires particular attention and a special investigation," Russian presidential spokesman Dmitry Peskov told state media. The FSB will release evidence proving "Kiev's plans to carry out a provocation in the Black Sea," state media said. The incident has sparked a broad international response, with a number of nations airing concern — mainly for Ukraine at the hands of its more powerful neighbor. The European Union issued a statement "urging all sides to act with utmost restraint." NATO called for "restraint and deescalation." "NATO fully supports Ukraine's sovereignty and its territorial waters," NATO spokesperson Oana Lungescu said in a statement. "We call on Russia to ensure unhindered access to Ukrainian posts in the Azov Sea, in accordance with international law." The 12-mile span has been touted by Russia as a claim to Crimea. Ukraine, along with nearly every other country in the world, refuses to recognize that claim. The clash is the latest sign that relations between the countries have gone downhill since Russia's annexation of the Crimea peninsula. Ukraine continues to wage a low-level war against a pro-Moscow separatist insurgency in the eastern part of the country. 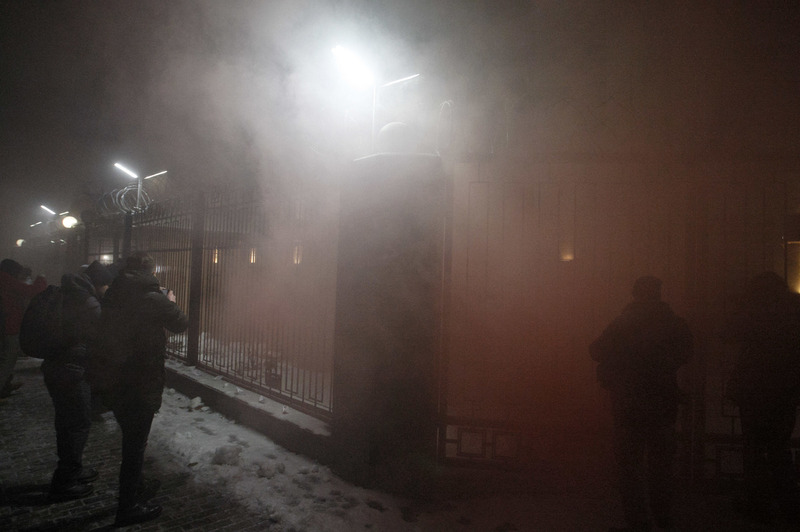 The Russian embassy in Kiev is seen covered in smoke during a protest of activists, following an incident in the Black Sea near the Crimea annexed by Russia, in which three Ukrainian naval vessels were seized by a Russian border guard vessels. Ukrainians reacted to the maritime standoff with anger. About 150 people reportedly gathered outside the Russian embassy in Kiev, where a car with Russian diplomatic plates was set on fire. "We gathered here today to protest against Russians over their actions today, over shooting of our military," protester Oleksiy Ryabov told Reuters. "We are very angry. We should have severed all diplomatic relations with this country a long time ago." Far-right protesters reportedly burned tires outside the Russian consulate in the western Ukrainian city of Lviv, saying Poroshenko is not aggressive enough in his relationship with Russia. NPR's Lucian Kim contributed to this report.